After trying out Ventnor last year (to very mixed feedback), Hipshaker returns to Ryde for the Isle of Wight Scooter Rally in August 2016. We will be at a new venue, the fantastic Royal Esplanade Hotel which has recently been taken over by a new management team and undergone a full refurbishment to a high standard. Each evening will also feature the Hipshaker DJs and our special Guest DJ Dom Cater. Smart dress sppreciated for evening events! Weekend package prices will vary according to the type of room booked. Some off road parking for scooters will also be available on a ‘first come first served’ basis for weekend guests. The weekend packages can be booked exclusively by telephoning the Royal Esplanade Hotel on 01983 562549. Hipshaker is back at the Isle of Wight Scooter Rally for 2015 on Friday August 28th and Saturday August 29th! We'll be based at the iconic Ventnor Winter Gardens, a fabulous Art Deco venue built in 1936. We'll be offering 2 rooms of music, the larger Hipshaker main room and a smaller Guest Club/DJs room with balcony that has fantastic views overlooking the sea. In addition there will be an afternoon event featuring live bands on Saturday (details to follow). Ventnor is easy to get to from the main towns with regular buses (every 30 minutes!) travelling to and from Ryde, Newport, Sandown and Shanklin. 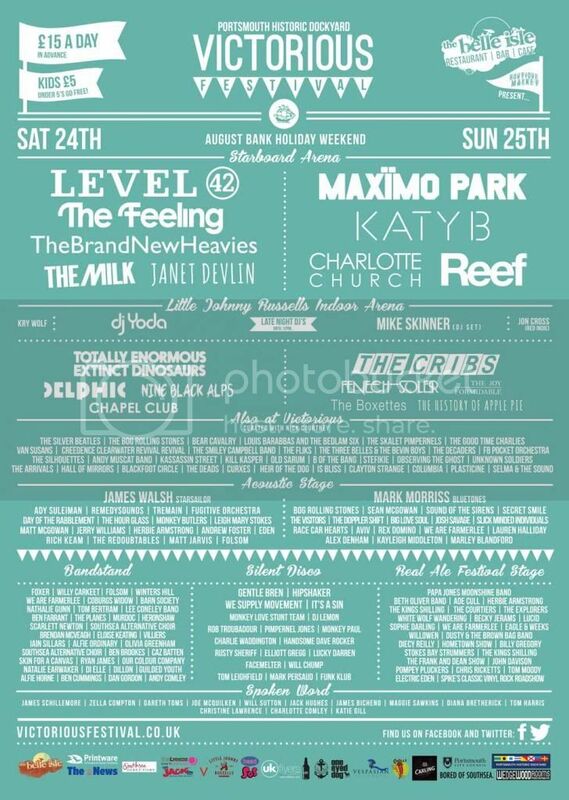 Not a mod event as such, although The Hipshaker Lounge might be a place anyone from here might consider popping in to …… we have just confirmed the bands we have on @ Isle of Wight Festival 2014. The Orders - A 60s inspired band for the MODern youth of today. The Ramonas - The UK's ORIGINAL all girl tribute to the Ramones, one of the most influential punk rock bands in history. Who's Who - The ultimate Who tribute act. Three Belles - 1940s vocal trio inspired by The Andrews Sisters. General Roots - North London's Finest Dub & Lover's Rock Heavyweights. Noasis - The definitive tribute to Oasis. Mayfield - UK based 8 piece band that write, record and perform original songs inspired by the very best Soul/Funk music from the 60's and 70's. The Clashed - Tribute to the Clash … "the only tribute that matters". Ska'd For Life - "Music is life, live a fun one, listen to the ska"
Plus we have Saturday and Sunday afternoon Northern Soul dance workshops hosted by Fiona Smith. 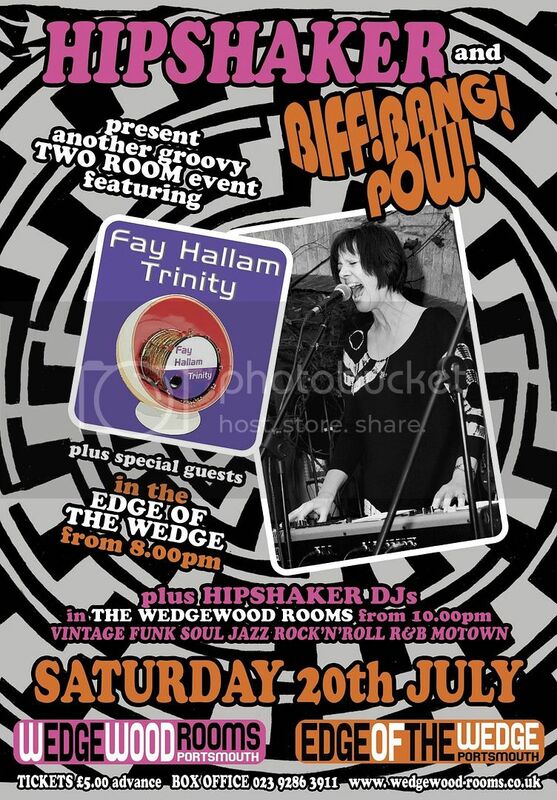 Fay Hallam Trinity are 60s and 70s influenced Mod, Pop and Psychedelic collective fronted by ex Makin’ Time songstress and 80s Mod Pin Up Fay Hallam. Fay, of course later joined Garage king pin – Graham Day (The Prisoners) with underground innovators the Prime Movers. FHT have now established themselves as flag bearers of an infectious and accessible groove that will satisfy both Indie heads and lovers of Pop Soul – Mod Style, made famous by London’s Legendary Blow Up Club. Fay’s distinctive vocal sound and smattering of Hammond organ always lift the roof live and this is a very rare chance to see her in Southampton. Opening up for Fay and Co, are local Southampton twee heroes The Spiral Tones. Who’s Blue Grass meets New Wave sound has ensured a strong following and continues to turn heads and ears with their live performances. DJ duties for the evening are left with SOUL45 spinning of course strictly vinyl 45s of Northern Soul Boogaloo Funk Motown will be playing well into the early hours. Tonic Music for Mental Health is a non profit organisation raising awareness of mental health and promoting recovery through music. HIPSHAKER & BIFF!BANG!POW! plus FAY HALLAM TRINITY & THE FLAVORS Live On Stage! Not a "mod" event, but at least a couple of bits that might interest some here ........ Victorious Festival in Portsmouth, £15 a day entry ....... includes entry to all of the "attractions" in the harbour I believe, e.g. HMS Victory, Mary Rose Museum etc. 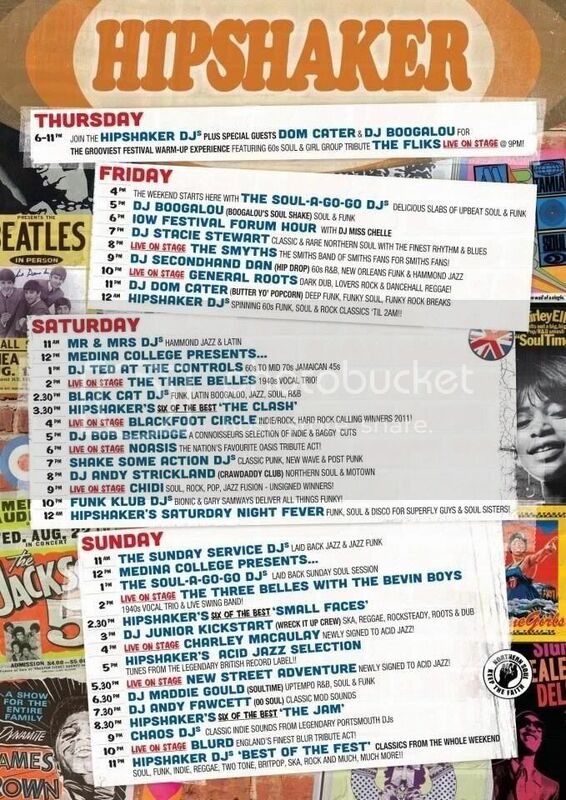 We're doing a DJ set on one of the days .... and I'm very much looking forward to seeing the Brand New Heavies for the first time in years. This topic has been moved to General music chat. TONIC 2 (Tonic Music for Mental Health: Promoting Recovery through Music). HIPSHAKER DJs + Guests, spinning tunes inbetween the bands and warming up for headline DJ TERRY HALL (The Specials). THE GROOVIEST FESTIVAL WARM-UP EXPERIENCE FEATURING 60s SOUL & GIRL GROUP TRIBUTE THE FLIKS LIVE ON STAGE @ 9PM! 8pm LIVE ON STAGE THE SMYTHS - THE SMITHS BAND OF SMITHS FANS FOR SMITHS FANS! 10pm LIVE ON STAGE GENERAL ROOTS - DARK DUB, LOVERS ROCK & DANCEHALL REGGAE! 12am HIPSHAKER DJs SPINNING 6Ts FUNK, SOUL & ROCK CLASSICS 'TIL 2AM!! 2pm LIVE ON STAGE THE THREE BELLES - 1940s VOCAL TRIO! 4pm LIVE ON STAGE BLACKFOOT CIRCLE - INDIE/ROCK, HARD ROCK CALLING WINNERS 2011! 6pm LIVE ON STAGE NOASIS - THE NATION’S FAVOURITE OASIS TRIBUTE ACT! 9pm LIVE ON STAGE CHIDI - SOUL, ROCK, POP, JAZZ FUSION - UNSIGNED WINNERS! 12am HIPSHAKER'S SATURDAY NIGHT FEVER – FUNK, SOUL AND DISCO FOR SUPERFLY GUYS AND SOUL SISTERS! 2pm LIVE ON STAGE THE THREE BELLES with THE BEVIN BOYS - 1940s VOCAL TRIO AND LIVE SWING BAND! 4pm LIVE ON STAGE CHARLEY MACAULAY - NEWLY SIGNED TO ACID JAZZ! 5pm HIPSHAKER’S ACID JAZZ SELECTION - TUNES FROM THE LEGENDARY BRITISH RECORD LABEL! 5.30pm LIVE ON STAGE NEW STREET ADVENTURE - NEWLY SIGNED TO ACID JAZZ! 10pm LIVE ON STAGE BLURD - ENGLAND’S FINEST BLUR TRIBUTE ACT! SOUL, FUNK, INDIE, REGGAE, TWO TONE, BRITPOP, SKA, ROCK AND MUCH, MUCH MORE!! Banter / Interesting explanation of "mod"